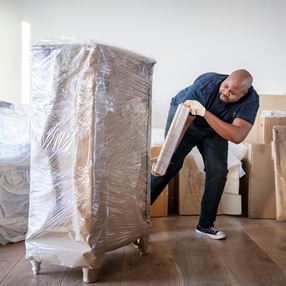 When preparing for a move to another state, one of the biggest obstacles is how to protect your furniture so that every single piece arrives at the destination intact. After all, packing furniture for shipping has always been the most challenging, time-consuming, and laborious moving task of them all. For this reason, most people prefer to hire a professional moving company that has years of experience packing and shipping valuable and delicate items, bulky appliances, heavy furniture, specialized equipment, and other large and odd-shaped items. Fine Art Shippers is just the right choice for this job! Our team is proficient in packing furniture for shipping over a long distance. Moreover, we work with many antique dealers, design studios, and galleries, moving and shipping for them furniture and home accessories of any kind on an ongoing basis. These include everything from luxury items created by the most prominent designers to unique antique furniture pieces that have both artistic and cultural value. Overall, whether it comes to valuable Art Deco furniture, an antique China cabinet, or your grandmother’s beloved rocking chair, Fine Art Shippers is the right place to come for help! There is one more good reason to hire Fine Art Shippers for packing furniture for shipping. You will be pleased to know that our services are tailored to meet any budget, which means that you do not have to spend a fortune when moving to another state. Just request a free shipping quote or simply contact our team to discuss your shipment. We are always ready to provide you with an offer you are looking for! However, that’s not all! In addition to packing furniture for shipping, our team can help you solve a whole range of other moving problems. For example, our furniture shipping service also includes professional crating of all the valuable and fragile items, transit insurance for your peace of mind, a variety of temporary storage options in the majority of US cities, unpacking and disposal of boxes and other unnecessary materials, furniture assembly and installation, and many other important services you may need. In other words, whether it comes to packing furniture for shipping, or you need full-service moving assistance from A to Z, Fine Art Shippers is always here to help! We guarantee that all your possessions will be handled with care and attention they deserve!